1. The bear who is in a costume suddenly started living in OL Kaoru-san's apartment. 3. His favourite item is his yellow pillow. 4．Rilakkuma likes to bully Kiiroitori who is Kaoru-san's pet. 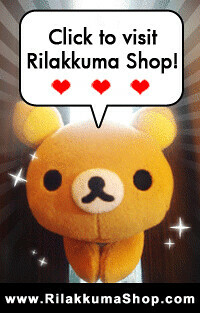 5．Rilakkuma's favourite food are pancakes, omelette rice and pudding! 6．Rilakkuma's favourite activities are listening to music, watching TV and soaking in the hot springs. 7. Rilakkuma has a zipper behind his back and it is with blue polka dots. The mystery of the zipper remains unsolved. 1．The white bear cub that came out of nowhere. 2. Korilakkuma is always mimicking Rilakkuma's actions. 3．Like Rilakkuma, Korilakkuma likes to listen to music. 4. Korilakkuma always like to play pranks on Rilakkuma. 5. Even though Korilakkuma likes to play pranks on people, her sleeping positions are still very cute! 1.Kiiroitori is the pet of OL Kaoru-san, he is a yellow bird. He likes to maintain the cleanliness of the house and oftens help to clean up Rilakkuma's mess. 2. He is often bullied by Korilakkuma's pranks.